Mezcal is a spirit which has been growing in popularity in recent years. 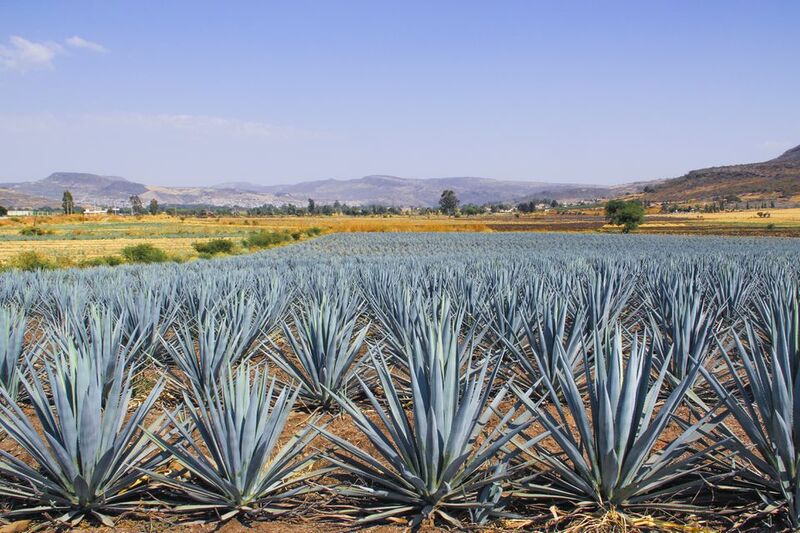 Like tequila, it is made from the agave plant, but while tequila is made with only one type of agave, the Blue Agave or Agave tequilana, mezcal can be made with many different varieties of agave, though the Agave espadin is most frequently used. Since 2005, mezcal has been under the regulation of Mexican law that determines that agave spirit may only be labeled mezcal if it is 100% agave and made within a certain region of Mexico that comprises 7 different states. 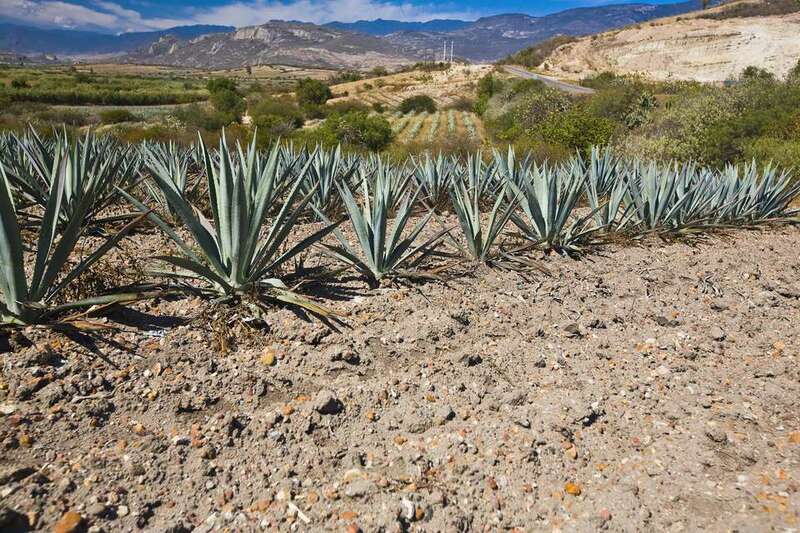 The main mezcal producer is Oaxaca state. Agave (pronounced "ah-gah-vay"), which is also called maguey ("mah-gay") in Spanish, is sometimes referred to as a "century plant" in English because it can grow to be very large and has a long life-span (25 to 30 years). Sometimes mistaken for a type of cactus, it actually belongs to a separate family, Agavaceae. The agave only flowers once in its lifetime, putting forth a tall stem from the center, and the plant dies after flowering. The agave is usually harvested when it is seven or eight years old. After the agave is harvested, the spines of the plant are cut off and the remaining heart, called the piña (which means pineapple, because of its resemblance to the fruit), can weigh up to 100 kg (220 pounds). First, a fire is started in the base of the pit, with river stones placed on top. When the rocks are red-hot, the ​piñas, which have been cut in half or in quarters, are placed in the pit. The whole thing is then covered with agave leaves and fiber and straw mats, piled up with earth and left to roast for four days. When sufficient time has passed, the roasted piñas are removed from the pit. Roasting brings out the natural sugars of the agave. It is very sweet and it's often sold in markets in Mexico in chunks to be eaten, in which case the tough fiber is chewed, then discarded. The roasted agave is crushed at a special grinding mill with a stone wheel pulled by a horse or mule. While the mule pulls the roller, a person uses a pitchfork to move the agave in the mill to make sure it gets ground up consistently. After the agave is crushed, it is placed in wooden barrels to ferment. Hot water is added to the barrel and left for a few days, then it is filled to the top with cold water and left to ferment for several days. The exact period of time will depend on the weather. When it's hot, the fermentation process is quicker. After the fermentation, the mash is distilled. The first distillation yields low-grade alcohol. The fibers are then removed from the still and the alcohol from the first distillation is distilled a second time. Mezcal Blanco or Joven is aged not at all, or up to two months. Mezcal Reposado is aged between 6 months and one year. Sometimes a worm (Chinicuil), actually a larva from inside the agave plant, is added to the mezcal at the time it is bottled. Only the mezcal reposado has a worm; you won't find a worm in mezcal Joven or reposado. Some people say that the worm adds to the flavor of the mezcal, but others claim it is simply a marketing gimmick. Mezcal añejo is aged for at least a year. The longer the mezcal is aged, the smoother the flavor. There are also cremas de mezcal which is sweetened and come in a variety of flavors, such as coconut, coffee, and passionfruit.